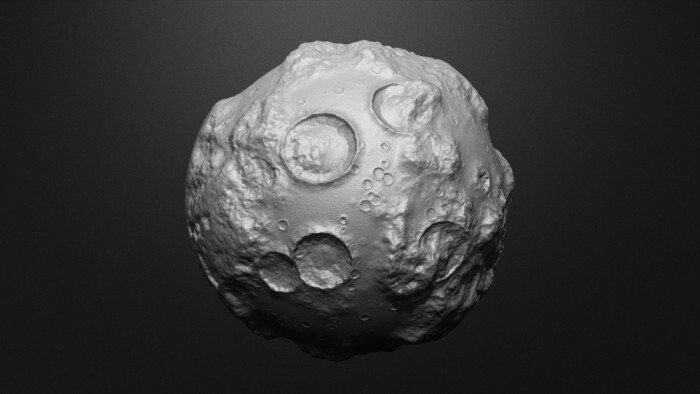 Based on the physical characteristics of an Asteroid or moon this 3D model (OBJ, 4R4 ZTL) can be used both as a prop or scene. Created in Zbrush 4R4 with 3 Subdivision levels this Asteroid Model was created and generously donated by the guys at QuadSpinner. This Model is not painted and does not contain UV maps. Click on the Red ‘ADD TO CCART’ button and then the ‘GO To CART’ button at the top of the page… follow the rest of the steps to proceed to checkout. Hope this helps. Cool work, Quadspinner! Thanks for sharing! Cheers, thanks for the support! Thanks again , very good ! Copyright © 2019, BadKing.com.au Page generated in 2.19 seconds ( 100.00% PHP, 0.00% MySQL ).